A bespoke access ramp has been manufactured and installed by Thorworld. 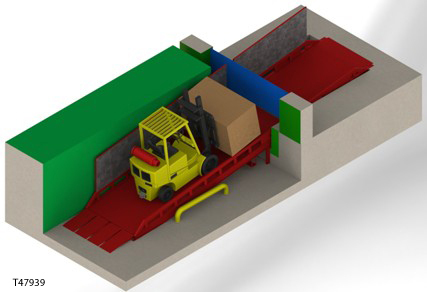 The ramp is set inside an existing dock leveller pit to provide access from outside the loading bay to the warehouse. The left hand side of the ramp has a 1500mm high safety barrier that is clad with galvanised steel sheeting to keep any trapping areas to a minimum and prevent damage to the adjacent building. The ramp is based on our standard 7,000Kg Type 10 Yardramp with a reduced overall width of 2000mm to suit the available space. The rendered image above was provided to the customer prior to manufacture. 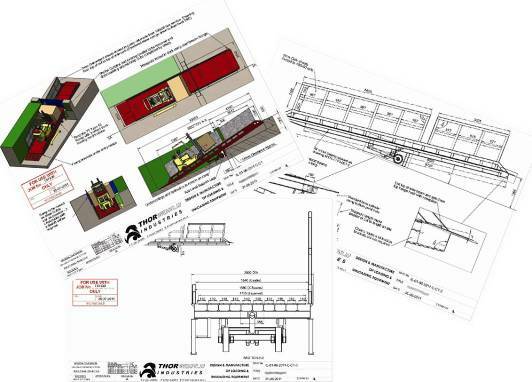 Detailed drawings were created to ensure the ramp was manufactured exactly as required by the customer and application.